FREE EVALUATION: We recognize that every dog is at a different level of training, so a full evaluation is recommended before training starts. The evaluation also gives you a chance to meet the trainer and see the facilities, along with receiving more detailed information on our training packages and techniques. The trainer has the opportunity to see dog and owner to begin the bonding process. Most often times, it is the owner that needs more training!! There is no charge for the evaluation. Listed below are the many programs we offer. Please feel free to contact us for any questions you may have. Any program can be combined depending on the results of the evaluation of you and your dog. Level II Personal Protection - Your dog will learn to protect in all situations-home, public, estates. 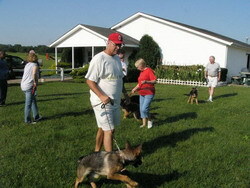 Schutzhund Training - This training is German training which includes-obedience, tracking, and personal protection. Service Dogs- Our staff is experienced in training dogs for any kind of assistance required for personal service dogs. 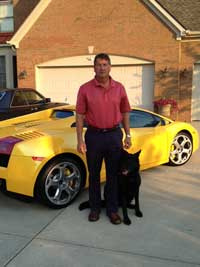 Bill Price/ Estate Dogs Intl produces (and has on hand) more Schutzhund trained dogs than many trainers. Mr. Price travels to Germany frequently to insure his breeding stock. Bill is the only American to have received the coveted Universal Seiger Award in OG Schleswig's clug in Germany.